Tornado Luxembourg, together with Spangdahlem Ice Hockey Varsity Team and the U.S. Embassy in Luxembourg, honors veterans and U.S. Armed Forces through hosting second “Veterans Day Hockey Game” on November 17, 2018. For the second time, a hockey game will take place between the Tornado Luxembourg and the Spangdahlem Air Base Varsity Ice Hockey Team in honor of Veterans, whether they served their country as soldier, fire fighter or police officer. Tornado, together with its partners, likes to consider this game as a great opportunity to honor service, commitment and duty, while strengthening the diplomatic relations between the United States and Luxembourg and promoting a sport that so many people, on both sides of the Atlantic, love dearly. The Veterans Day Hockey Game will take place at the Kockelscheuer Ice Rink on Saturday November 17, 2018 from 19:00 to 22:30. The event will begin with a small opening ceremony honoring those courageous young men and women who served their country. Entry tickets will cost 8 euros each, with 3 euros going to charity. Children under 16 will be free. Food and drinks will be available for purchase on site. Free 24 hour parking will be accessible at P&R Kockelscheuer, a five-minute walk from the ice rink. 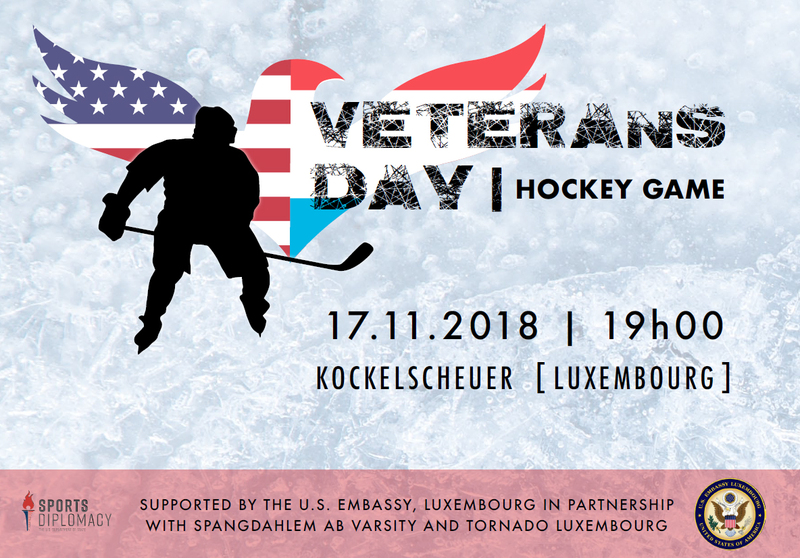 Tornado Luxembourg, together with the U.S. Embassy, has created a Facebook Event for Veterans Day Hockey Game that will provide anyone interested in attending with all the need information. The event can be found here. Pictures from last year’s game can be found here. Written by Gilles Mangen, 15/11/2018 14:32.